Calibrate with clear filaments for better results. This is a repost from another thread but I thought it might be worthy of its own thread to discuss the pros and cons of this method and get others thoughts on it. These findings seem to make a good case for using clear filament to calibrate your printer because they give you a clue when settings are negatively impacting the filament through overheating. So here are my findings: Clear PETG has a tell tale that you do not see in colored filaments. When clear PETG gets too hot it gets a lot of micro bubbles giving it an opaque white look instead of a translucent appearance. I remembered this when extruding into air and seeing it come out clear at 5mm/s then i remembered i had lowered all of my jerk and accell settings to match a post that deckingman had made during his testing of pressure advance. I was already slicing at 75mm/s without reductions in speed for any features accept first layer. So i raised my accel and jerk settings a lot and increased first layer speed to 80% (60mm/s) though 70% (52.5mm/s) is probably better (note that these first layer speeds need a build plate like polycarbonate) then reprinted with the Taulman Blueprint PETG…. On the left is the new print, on the right is the failed print from before (bed adhesion issues)... as the print got to smaller features and slowed down (firmware settings not slicer) the PETG started breaking down and becoming opaque because the filament is spending too much time in the hotend for a given temp. That's true and fairly useful, but did you see the video Angus (or might have been Tom) did on printing transparent objects? They found over-extruding to eliminate the air spaces between extrusion lines gave the most clear objects. So As long as your extrusion is very well calibrated and this effect isn't going to be confused with over-extrusion, which will give more transparent objects, then yes this seems to be a useful trick. What is interesting is this overheating i am observing is because of the filement spending too much time in the hotend. I am still running different prints to see of i can find the best combination of settings. What is interesting is that I found while turning up things like jerk and accell had a positive effect. turning up the overall speed doesnt necessarily equal better results. Maybe because more plastic is extruded when the speed is turned up? My other big question is how will this translate into other filaments… will dialing in a clear PETG necassarily result in better prints for say PLA or ABS, carbon fiber etc. I should add that forbthe sake of these tests I am keeping pressure adavance off. I think the big difference between the over extrusion clarity and the flow rate clarity is that the micro bubbles present themselves as white the second it is being extruded where Toms hack has to do with achieving better clarity on an otherwise already translucent part. But then strength comes into it, my understanding is that higher temps result in stronger parts as there is more interlayer adhesion, but might reduce quality due to bubbling (breakdown of the polymer or additives in it). Its all a balance. With regard to adhesion on PC buildplate, ill leave that to you mate, you'r the expert. Don't know about their "normal" PETG but Taulman recommend printing T Glass really slowly (oh and with a big nozzle like 1.0 - 1.2mm - but then you'd have to print slowly with that size nozzle). Yeah T-Glaze/Glass is a completely different animal but even with it they warn that if it is becoming opaque then it is too hot which is the filament breaking down. I am not a chemical expert but I can only guess that this same thing is happening with other filaments when they are spending too much time in the nozzle for a given temp which is why I started this thread because there are some really smart people on this forum, hopefully someone here has some insight into this. What I am hoping to find here is a balance of jerk, accell and temp for any given print speed and hopefully the settings will translate well into quality prints for other filaments but that might not be achievable. At the moment I am finding what works for larger areas doesnt necessarily work for smaller areas but I will keep testing. Yeah, I thought so as well until I tested the flexibility of the two parts side by side and there is definitely more flex in the opaque version. The larger piece of this part that I am printing (not seen in the photo is 55mm x 55mm and 2mm thick so it is pretty easy to test the strength. I have not used a scale but I cannot break the part with my hands that is translucent and can easily fold and break the one with bubbles. I can extrude into air 5mm/s with clear results at the entire recommended temp range but then when filament begins to ooze out after extruding 50mm of clear the oozing filament is coming out white, so it appears that it is related to how long the filament spends inside the hotend before it begins breaking down for the given temp. So printing at the higher end of the range it needs to be pushed through faster than if you are extruding at the lower end of the range (which is a practice that most of us follow anyway). As far as the PC buildpate goes, I do not feel that it plays a part I just think it was an indicator that something was happening, something that probably would go un-noticed on a different build plate. That's a definite, and can be one of the problems with a mixing hot end. 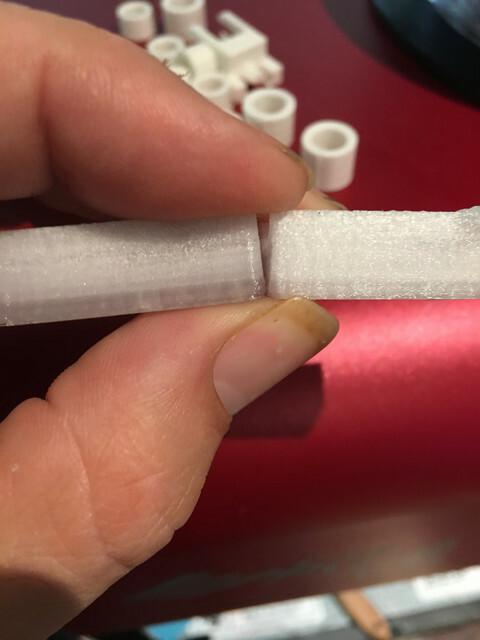 What can happen is that the loaded but unused filaments "cook" inside the melt chamber even at normal printing temperatures if left for any length of time. Then when you come to start printing with that filament, what comes out to start with, for the first few mm, is a lot of vapour and a very runny, almost liquid messy stuff. You have to be aware of that and try to keep all the filaments moving, even slightly and/or arrange/slice the multi part object in such a way that no single filament is left unused in the melt chamber for too long.